I started this blog to show the absolute beginner how to make money online using a plethora of different strategies. Each week I try to write a new piece that teaches newbies how to do just that. This may not be a very long post but it doesn’t need to be. It’s a very simple strategy that requires very little explanation. I’ve never found another method that allowed me to make money faster than this one. Before I explain what it is and how to do it… I want to talk briefly about how most people use Clickbank to make money and how it differs from the strategy I’m about to reveal to you today. Most people (read: affiliates) go to Clickbank and look for “high gravity” offers. In case you’re unaware, Clickbank is a marketplace where affiliates go to find digital products to promote. They’ve invented the term “gravity” which basically tells you how many affiliates have recently made money promoting that product. It makes sense to try to find products with a higher gravity because you want to choose something that’s already a proven winner. Makes sense, right? Sure it does. If I was looking for a weight loss product to promote, I would most likely choose one that ranks within the top ten highest gravity. That’s how most people approach the Clickbank Marketplace. They choose a category, sort the results by highest gravity, and pick one of the top offers. When you already have an email list of subscribers who are interested in a specific topic, that’s a great method. It’s also a fairly good method if you’re paying for traffic. Unless you’re in a very competitive market. Then it becomes challenging. You have to watch your campaigns close. Keep your CPC’s down. Watch your conversion rates. Track your keywords closely. It’s a never-ending game of crunch the numbers. If you’re just getting started online and have no clue how to compete with the “big boys” of affiliate marketing and paid traffic, read the rest of this piece very closely. The method I’m about to reveal to you is underused, has very little competition, is quick and easy to set up, requires very little maintenance, and is pretty inexpensive. In short, the method/strategy is this: direct-link to Clickbank offers using paid traffic. Pretty straight-forward. A bunch of red flags probably just went up in your head. You’ve been told (I’m sure) to NOT direct-link straight to an offer. And to NOT send people straight to a sales page. Gurus/marketers/copycats teach what’s already been taught and repeat what they just heard last week WITHOUT testing any of it themselves. I’d choose to listen to the second guy. That second guy… is ME. Moral of the story, pay close attention to who you’re taking advice from. Okay, back to the strategy. It’s more than that though. At the time of writing this, there 6,217 products for sale inside the Clickbank Marketplace. I’d venture to guess that only about 10% of those are currently being promoted by affiliates. That’s 621. That means there are more than 5,000 products that are being completely overlooked by the majority of affiliates. Even better than that… there are hundreds of NICHES being overlooked by the majority of affiliates. And that’s the secret to this Clickbank strategy. Finding “hidden niches” within the Clickbank Marketplace that are in-demand and actively making sales. Now, in that last sentence, I included 3 requirements for making this method work. The niche needs to be “hidden” (meaning unpopular to most affiliates). searching for information on the topic). The niche needs to be actively making sales already. Don’t worry, I’ll go over each one in detail. This is a really cool trick that I’ve never seen anyone teach or do. Like I said earlier, most affiliates try to find products that other affiliates are already promoting successfully. Which basically means, competitive niches. Instead, I like to find niches where the product owner is the only one making money. 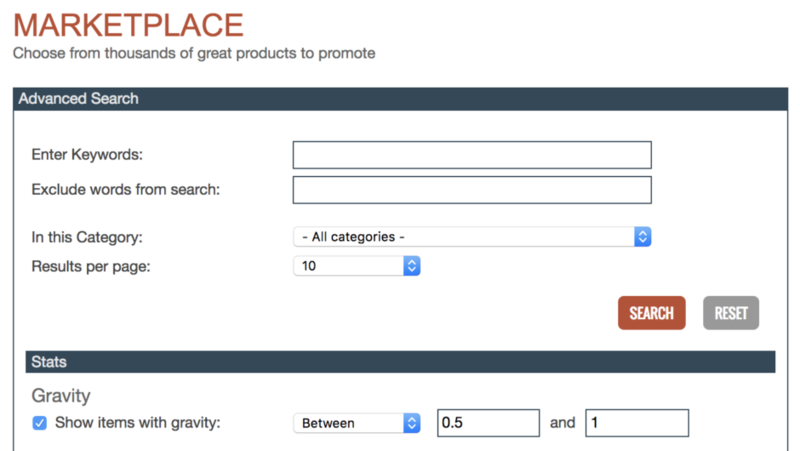 To do this, you just search for products that have a gravity of 1 or below but above 0. This tells you that 1 affiliate (or vendor) has made money promoting that product recently. The lower the number, like a 0.19, a 0.37 or a 0.49, the longer it’s been since they’ve made a sale. After a few months time, that number will go back to 0 if they haven’t made a sale. So, you really want to find products that have a gravity closer 1. You can do this by choosing the Advanced Search option in the Clickbank Marketplace. This will return hundreds of products in tons of different niches. Niches you’ve never even heard of before. And don’t think for one minute that these are under-performing or low-dollar per month niches. I know a few product owners who use Clickbank as their payment processor because of their upsell functionality and tracking capabilities. A couple of those guys are doing mid 5-figures per MONTH. That’s what this strategy does… it allows you to find product owners who are quietly selling thousands and thousands of dollars worth of their products, in tiny little niches. Then you can swoop in and drive more traffic and make more sales for them while taking 50% or more of the sale. I just did a quick keyword search to find search volumes for one of these niches I just uncovered… 59,780 monthly searches from about 8 keywords. That’s not even including all of the longtail keywords I could quickly add. You’ll find out in a minute the traffic source I suggest you use for this strategy. I’m getting clicks for pennies in these niches. Some people are happy with 1,000. It’s all about how much you’re expecting to get out of each niche. There’s no reason you can set up 100 of these little things. The ad network I recommend for this strategy is Bing Search PPC. I love this ad network. Yes, the volume of traffic is lower than Google AdWords but AdWords is way too expensive. I’m getting clicks on Bing for pennies… literally pennies in niches like these. Obviously, if you’re in a more competitive market, that’s not possible. But I’m getting clicks for very, very competitive weight loss keywords for less than $0.50. That’s more than half of what AdWords charges. That 59,780 searches per month that I told you about above was a product I just found in the Clickbank Marketplace that had a gravity of 0.89. Meaning one person has made money promoting that product recently. 59,780 searches per month (on the low end). I always at least get a 3% click-through-rate. It’s usually higher but we’ll say 3% just to be safe. That means I’ll get 1,793 clicks per month. I always conservatively guess the conversion rate (to sale) at 1%. Meaning one percent of the traffic that I drive directly to their sales page will buy. That’s 17 sales per month. The commission on this product is $17.95. That’s $305.15. Let’s say my cost per click is at $0.10, which is also probably high. That’s an ad spend of $179.30 leaving me with a profit of $125.85. Not really that exciting, I know. But you know what? It will take you less than 30 minutes to set that up and once it’s running, you really don’t have to mess with it. Maybe once a week (or once a month usually) you can go in and tweak the ads to try and increase your CTR. You can set up tons of these little campaigns. And here’s a really big secret about Bing advertising (all advertising really)… the higher your CTR is, the lower your CPC goes. It’s a math game for the ad networks. They know if you have a high CTR, they’re making more money. They’ll show your ad closer to the top of the page and they’ll reward you with lower CPCs. You can split-test your destination URL and send half of the traffic to the Clickbank offer and the other half to a squeeze page on your site. You can give away a free guide related to the niche and add a few follow-up emails to promote the product. Make sure you’re tracking your sales though so you can tell which method is more profitable. Sometimes it’s more profitable just to send traffic straight to the sales page. You just forfeit your chance of building an email list. Either way, this is a quick and easy way to make money online without a bunch of hoopla. There are literally HUNDREDS of these hidden niches in Clickbank. This strategy is brilliant… thanks for posting this, Duston! No problem Bruce, glad you liked it! As long as the page your ad links to follows their advertising policies then you’re fine. I just signed up on Clickbank. Do I really have to wait for weeks and undergo the training before I can finally use clickbank and earn money? All i can see right now are the training modules. No, you should have instant access to the Clickbank Marketplace where you can choose a product to promote and create an affiliate link. A myth is that pages need a lot of text to rank. They don’t, but a lot of people still try to make text bulkier and unique page-to-page. That’s true, to an extent. If Google determines that the content is the most useful to the reader then they’ll rank it number one no matter what. So, how do they determine that? 1. You have the highest amount of “backlink juice”—either a lot of relevant backlinks from lower authority sites or a few relevant backlinks from high authority sites. 2. They monitor the actions of the person searching—did they read the whole page, did they click around to other content on the site, did they engage with the content somehow. In some cases, a search topic returns results with little to no valid data on either of those two points above. Then, Google compares the actual content versus other potential sites. hello! this is a great site and i usually enjoy the data posted here. Bookmarked and shared. Thanks yet again!